Top seed Rafael Nadal dashed British hopes for a second year running by beating fourth seed Andy Murray 5-7, 6-2, 6-2, 6-4 on Friday evening to keep alive his bid for a third title at The Championships. Victory extended the Spaniard's winning streak to 20 matches at the All England Club. "Always Wimbledon was my dream," said Nadal. "I never thought that I would be able to play five finals, so today is a very important victory for me and I am very happy for everything." "Today I lost the No. 1. One guy played unbelievable the first half of the year so he's the new No. 1,", said Nadal. "We just can congratulate him because what he did this first part of the season is something really impressive, really fantastic. I am happy about how I did. I think in normal conditions I would be No. 1 or have a lot of chances to keep being the No. 1, because my results are really good the first part of the season, too. But one guy did unbelievable, and congratulations." The 25-year-old Nadal is bidding to join Sweden's Bjorn Borg as the only two players in the Open Era (since 1968) to win the Roland Garros-Wimbledon title-double three times. 1954: This from Nadal as he strides off: "For me, it's a dream to be back in the final. I'm very happy. 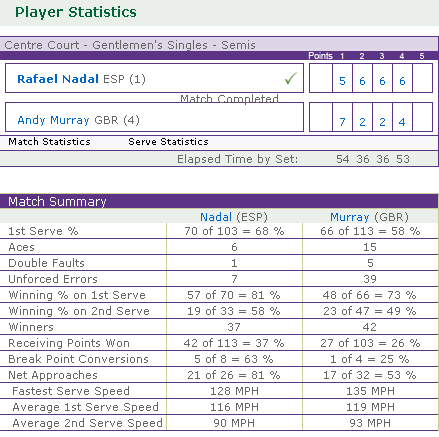 I feel sad for Murray, I think he deserves to be in this final too. I wish him all the best for the rest of the year. He's a great champion and the only way to beat him is to be really aggressive and play some fantastic shots. He was playing fantastic at the beginning, but he made a mistake at the beginning of the second set and that was one of the turning points of the match. It's always tough to play against Novak [Djokovic], he's playing fantastic this year and has only been beaten once. I've lost four times already against him but I will try my best, as always." Andy Murray's former coach Miles Maclagan: "Nadal is an amazing individual. He faced some adversity and he faced a guy playing excellent tennis but his concentration and belief never wavered. But Andy can take so many positives from this. He has played this match in the right manner and the lesson he can take is that in Nadal here we have a man who can play at that high intensity for five sets if necessary." BBC Radio 5 live summariser Pat Cash: "When Nadal is in this mood he is almost impossible to beat. How do you stop him?" Boris Becker on BBC TV: "Well he's got one more set than last year so that's an improvement but overall it's the best Andy Murray I've seen at Wimbledon. He's facing a better player at the moment. 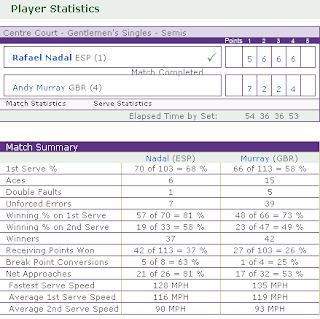 Nadal has too much firepower but Murray's still young and he's still learning." John Lloyd on BBC TV: "He's got to look at this match and go back to the camp and say how do I keep and raise my intensity and stay with someone like Nadal for three to three and a half hours. There was not one hint of panic from Nadal and he knew that it was tough for anyone to stay with him and they didn't." Olga S on Twitter: "Ah well, he managed to take a set off him this time. Two sets next year and into the final in 2013?" 1945: So there it is - Rafael Nadal v Novak Djokovic in Sunday's final. The best two players in the world, the winners of the first two Grand Slam events this year. Sport can be a crazy old unpredictable beast, and that's why we love it, but a lot of the time it's a matter of cold, hard logic.